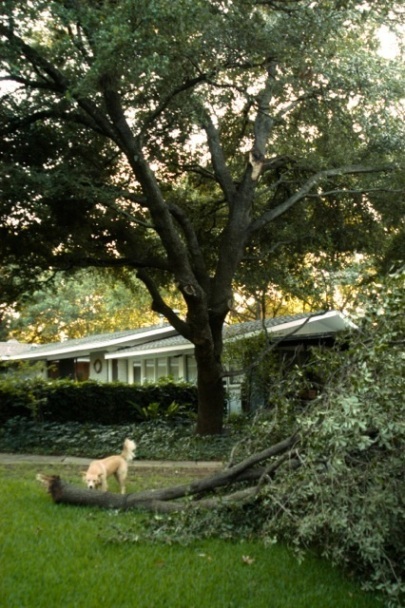 Limbs fail sometimes because of defects and unusually heavy loads of foliage, but there is another kind of failure known as "summer limb drop," "high temperature limb drop" and most recently as "sudden branch drop." On a windless, hot summer day or evening, large limbs suddenly and mysteriously break with a loud "crack" and crash to the ground. Failed limbs usually reveal no obvious external defects and the inner wood is broken bluntly, with no sharp splintering. Sudden limb drop has been reported in many countries and related to many tree species. Numerous arborists have looked closely at affected trees to find some visual clues that will explain the causes, but consistent warning signs have not yet appeared. Some theories about the cause include change in branch movement, tissue shrinkage, internal cracks, moisture changes, ethylene gas released inside of branches and microscopic changes in cell wall structure. But, there are still no definite answers. Trees with limbs that fit the profile for sudden limb drop are usually mature with limbs that are very large and horizontal with an upsweep toward the end. The limbs usually extend beyond the main canopy of the tree. Most often these failures occur on hot still days with no wind. We agree with the theories that this is a tree’s response to a situation where the demands for transpiration exceed the capacity of the vascular system of the tree. This imbalance causes the tree to abort limbs. 1. Properly exposed trunk flares (also known as root flares). 2. Quality pruning which avoids flush cuts and excessive thinning. 3. Timely plant health care: organic fertilization, soil aeration, and insect/disease prevention and control. Surprisingly, proper watering is the biggest challenge. Stress in trees caused by improper watering (primarily over watering) is very common. Light frequent watering cycles over a long period of time weakens trees by promoting shallow, weak root systems. Remember it is better to water less often for long durations to help promote deep healthy root systems. Summer Limb Drop is a common syndrome that happens when trees are struggling to balance the water coming in and leaving the plant through transpiration. The Sick Tree Treatment will help. Here is a link on more information on this tree quirk.